Dolpo region was closed to trekkers until 1989 when the southern part of Dolpo was opened for organized trekking groups. Upper Dolpo Trek is one of the most exciting and thrilling trekking experience. Upper Dolpo Trek takes you to the remote parts of the Himalayan country. In addition it also gives you the chance to experience a whole new world of culture, religion and traditions.You will be amazed as you traverse along the grazing land of yaks and sheep, pastoral settlements, old monasteries and diverse ethnic villages and settlements. Peter Matthiessen’s book named The Snow Leopard made Dolpo region very famous. Moreover, Nepal’s first English subtitled movie on Dolpo was “The Caravan”. It was also a huge success making it a nominee for Oscar Award in the best foreign language film category. After the release of this documentary movie, This trek started to lure the trekkers towards it. It was directed by Eric Vallie. Bharal Adventure Pvt. Ltd. too went there for the trekking and made an excellent itinerary for the region. This twenty-eight days trek also takes you to Shey Gompa monastery, built in 1655, noted for its giant copper with the gilded gold statue of a seated Shakyamuni Buddha. To the east of the gompa, There is Crystal Mountain. Shey Phoksundo Lake is another highlight of the Upper Dolpo Trek. 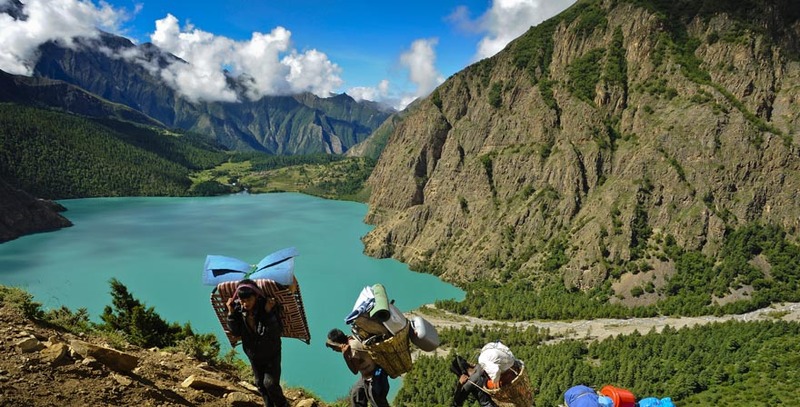 This is the deepest Lake of Nepal which is located inside the Shey Phoksundo National Park. Book the Upper Dolpo Trek with the team of Bharal Adventure. Hence, You will realize the wilderness dream of traveling in off the beaten trekking trails of Nepal. Bharal Adventure assures you best hospitality and quality services. Upon arrival, the representatives from Bharal Adventure will pick up the guests from Tribhuvan International Airport in Kathmandu and drop them at their hotel for rest. An afternoon stroll and souvenir shopping around the streets of Thamel will be arranged. The guests will be served delicious Nepali cuisine as welcome dinner by Bharal Adventure. After breakfast, guests will set off to a guided tour to four of the UNESCO World Heritage Sites in Kathmandu, Kathmandu Durbar Square – ancient palace of the then kings of Nepal, Hindu temple Pashupatinath, and Buddhist stupas Swayambhunath – The Monkey Temple, and Boudhanath. At noon, the pre-trip discussion will be organized where the participants could meet their team leader and crew members. One hour flight from Kathmandu will take us to Nepaljung, a city located in Western Nepal close to Nepal-India border and which also serves as a gateway to Simikot in Humla. We will be spending the rest of the day exploring the local market, mini-zoo and nearby villages of this interesting and colorful town in Terai region. After breakfast, we fly to Jhuphal, a beautiful town located over the Himalayan foothills rewarded with the views of Annapurna and Dhaulagiri peaks to its north. We meet our trekking staff and from here, begin our adventurous trek through terraced fields to the Bheri River and its narrow gorge. We continue our walk to Dunai, the administrative headquarter of the Dolpo region where we camp for the night and explore the town in the evening. Leaving Dunai after crossing a suspension bridge, we turn to the west following a trail past a hospital from where the trail ascends up the side of the treeless Thulo Bheri Valley before entering the Phoksundo River Valley. The exhilarating view of Kagmara Peak welcomes accompanies us as we follow the trail passing through walnut groves, Dhera and Rahagaun villages walking down the dense jungles until we reach Ankhe. Ascending up and down a wooded riverbank and climbing up on a steep trail, we start our day’s trek from Ankhe. We pass through the forests and grassy slope high above the river trekking downhill surrounded by lush forests before reaching a cliff followed b a dizzying drop on a wobbly stone staircase to the river bank until we reach Sulighat. Continuing our journey along the valley floor to the confluence of the Phoksundo and Pungmo rivers, we cross a bridge and walk on the western bank of the Pungmo Khola from where we follow the trail passing through a cedar forest before reaching Palam village. Now, we ascend up to a ridge enjoying the distant views of Phoksundo Lake and the spectacular sight of one of the highest waterfall in Nepal. From here, we descend through birch forests to the upper reaches of the Phoksundo Khola towards the picturesque Ringmo village with its mud-plastered Chorten and Mani walls. A short walk from here will take us to the shores of Phoksundo Lake where we will camp for the night. This day will be spend on acclimatization along the Phoksundo Lake for which we will go on a short hike to the Ringmo village and its Tibetan Buddhist Monastery during the day. We will get a chance to explore the local culture during our hike. The people in Dolpo wear homespun clothing which is sometimes dyed a maroon color and they also favor Tibetan-style somba or dhocha (boots with upturned toes) for footwear. Both men and women are seen wearing religious amulets and strings of coral, amber and turquoise as well. Moving up around the top western end of the Phoksundo Lake contouring on a rocky ledge along the lake’s western bank, we walk this unsteady trail suspended on a gangway of wood supported on pegs driven into crevasse in the rocks. The path leading through a lush meadow opening up into the flood plain of the Phoksundo Khola is situated at the westernmost edge of the lake. From here, we walk through the valley crossing the river and avoiding the occasional boggy marsh underfoot before coming to the bank of the river for camping overnight. We walk through a glacial valley for an hour heading north until we reach the confluence of the Phoksundo Khola and another mountain stream below an old wooden bridge. From here, we head north-east climbing up to a sheep meadow where our trail veers up a steep ravine. A hard climb up the top will bring us to another valley from where we can get the view of Kang-La Pass. It is near the pass that we set our camp in a place which was christened as ‘Snowfields Camp’ by Peter Matthiessen. We begin our ascent along the steep trail in the morning and climb up to the top of the pass following a strenuous track. Admiring the views of large valley dissected by a gushing river for a while, we descend to the valley floor via steep trail after which we walk on a meandering trail along the banks of a river, crossing and re-crossing it several times. We reach Shey Gompa after crossing a quaint log bridge. On this day for acclimatization, we will hike around Shey village which is famous for its ancient pre-Buddhist culture, the Bon Po. In Dolpo, the ancient Tibetan way of life combines animism with the teaching of Buddha. Following a pleasant trail amidst juniper trees we descend into a grey, stony canyon from where the path begins to zigzag over bare rocks and coarse eroded soil until it eventually takes us to the top of Saldang-La Pass. From here, we descent towards the north along the grazing lands of yaks and sheep as well as nomadic tents made from yak hair in the view as we come close to Namduna Gaun. We visit Namgung monastery built with red stone resting beautifully against the backdrop of a cliff on the north wall of a gorge. Leaving the village, we climb up a slope and begin our walk along the dusty barren mountains for about three to four hours until we see Saldang village below us on a plateau high above the Namga Khola stream. The largest village of the inner Dolpa area, Saldang stretches for nearly two kilometers on an open slope and consists of five villages. Walking further north along the Nagon Khola on a wild and barren terrain, we begin our trek on a fair trail with few ups and downs. Passing through Marang and Ki villages, we cross a tributary of Panzang River walking east across the river again before we reach Yangze Gompa that accommodates an old Bon-Po Monastery. There are two trails from Yangze Gompa to Sibu among which we will take the shorter path going through Saldang village from where we will walk along a river and pass through terraced fields, stupas, Chortens, heaps of Mani stones and a Chaiba monastery passing through the Namdo village, a prosperous village of about sixty houses with nearly 400 inhabitants. The village stretches for more than five kilometers on the high slopes to the left of Nam Khong Khola where Namdo monatery is located near the riverbed. We walk further down the river for another two hours until we reach our camp site near Sibu. Walking along the Nam Khong Khola for a while, we pass by caravans with yaks moving towards the Tibetan border. We turn east and walk ahead for a while until we arrive at a confluence of two small streams from where we follow the steep trail ascending to a grazing area below Jeng-La Pass. We will set our camp at this very beautiful meadow. The day starts early as we set ourselves up for the day’s activity. We trek for two hours to reach the top of the Jeng-La pass and lose ourselves in the mesmerizing views of the north face of the Dhaulagiri massif. After capturing the fascinating sight into our memories and camera, we descend on a rough trail to the Tarap Valley that has vast plains in high mountains extending twenty kilometers along Tarap Chu River. We camp nearby a monstery in Tokyu village. Trekking downhill on a plain valley filled with patches of lush grass on both sides of the river, the place also have a marsh that is a common feature in the Desert Mountains of Tibet and the Ladakh Himalaya. We reach Dho Tarap after trekking for a short while. This day is set aside for rest, however, it doesn’t mean that the day will be spend in the hotel room or idly without any activities. On this day, we stroll around the village of Dho Tarap surrounded by an irregular stone wall. We will explore and observe the local culture of the area on this day. At Dho, about forty houses are divided into three clusters and built in a haphazard way inhabited by few Tibetans and mostly Magars. A visit to a Buddhist Gompa could also be arranged and we can also go for a visit to Bon Po Gompa. Descending towards a wide valley eventually narrowing into a gorge, we walk along the juniper and wild rose bushes just above the tree line. We will be rewarded with the views of herds of blue sheep on our trek and in the afternoon as we reach the confluence of the Tarap Chu and the Lang Khola, a stream joining Tarap Khola from the east, we prepare to set our camp on a nice meadow known as Kamakharka. Continuing down the gorge of Tarap Khola, we walk past local people taking their herds to lower pastures for the winter. One of the most exciting days of this trip, on this day we go along the valley that becomes narrow in a deep gorge where we can jump from one side to another. There will be time when there is no trace of path and we will have to walk across stone slabs fitted on logs in between the walls which which act as a bridge. The bridges are either damaged or washed away which is why we might have to cross the icy torrent on foot. This adventurous and thrilling journey will come to an end as we reach our camp site at Khanigaon beside the Tarap Khola. Following the trail to Lalberi, we pass through lush forest descending into another gorge as we continue to follow the river again. As we reach Tarakot, we can arrange a visit to Sandul Gompa which is located at about eight kilometers east of the village at a juncture of Barbung Khola and Tarap Chu. The monastery stands on a hill at the south of Bheri River. We camp for the night by the Tarap Chu River which is about 150 meters below Tarakot. Starting along the trail behind the Bheri River before crossing a bridge near Lawan village, we continue alongside the river ascending to Byas Gadi from where we move towards the west on a comparatively easy trail. Crossing the river near the Lochakhola Gaon, we descend to Dunai where we spend the night. Trekking along the Bheri River in the company of the beautiful landscape, we pass through Dhupichaur and Rupgad villages until we get reach Kalagaonda village from where we trek past Motipur village before arriving the small airstrip in Jhupal. We take the first flight from Jhuphal to Nepalgunj from where we take the next available flight to Kathmandu. As we arrive in Kathmandu, we can spend the rest of the day exchanging emails and organizing photos with our travel companions. An extra day for you to spend in Kathmandu exploring the city, shopping for souvenirs or visiting places that you did not get a chance to go earlier. A farewell dinner will be hosted by Bharal Adventure in the evening to celebrate the successful accomplishment of your venture. A representative of the Bharal Adventure will accompany you to the airport approximately three hours before your scheduled flight with which you will be bidding farewell to this Himalayan country. The following are what we advise you obtain in the way of equipment and gear before trekking in Nepal, and are meant to keep you mobile and comfortable in a range of expected weather conditions. Trekking gear can be rented or purchased in Kathmandu at cheaper prices, remember Nepal is the home of Mount Everest, there is plenty of choices and our staff can assist you with the necessary arrangements. Except for your day pack, all luggage will be carried by porters. There is an allowance of 33lbs/15kg per person. Additional personal items not needed for the trekking portion of the trip can be checked in the hotel’s storage room for no extra cost.